What keeps a foam wall from collapsing under van der Waals attractive forces? It's charged heads for ionics and tails (plus a bit of spontaneous charge) for non-ionics. These forces can be captured by a simplified DLVO approach. the aim is to get a positive ("disjoining") pressure, Π, from the charges and steric effects, and to get it at the greatest possible thickness to resist random fluctuations and contamination. (which create "Laplace" capillary forces) linking the walls, leading to the collapse of the foam unless something stops the wall from becoming too thin. That "something" is the repulsion ("disjoining pressure") between the surfactant molecules on either side of the wall. Such repulsions (and the van der Waals attractions) are best described via DLVO theory. 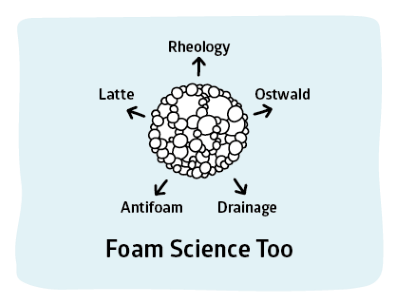 Providing the disjoining pressure is greater than the Laplace forces that wish to drain the water from the walls, the foam will remain stable. As we will see, for charged surfactants the repulsions are relatively large at "large" thicknesses (~30-50nm) and the films that are stable at this thickness are called common black films. For nonionic surfactants stability sets in via steric effects at low thicknesses (~5nm) which are Newton black films. Whilst in theory both are stable, it is obvious that the thicker common black films are more stable to minor disruptions than the very thin Newton films. This is one reason why most common household foamy cleaners are made largely of ionics such as SLS or SLES. works very well to describe the pressure v. thickness behaviour of a thin surfactant film in a foam. There are three effects: electrostatic (el), van der Waals (vw) and steric (st). The first two are well-characterised, the third is relevant only for very thin films and is not as well-validated as the others. Molarity, c, and charges of the electrolyte from which the Debye length can be calculated - this is needed for the electrostatic term. Hamaker constant, AH, which can usually be left at 4E-20. The plot is logarithmic to cover the wide range, but this makes it impossible to show negative values. So a pseudo-log plot is used where negative values don't mean fractions but negative values. So -2 means -100 Pa, not 0.01. One of the obvious lessons from this model is that the stability of the walls of foams based on ionic surfactants is seriously compromised by a large increase in the concentration of salts in the water. These shield the charges on the head of the surfactant and therefore reduce the mutual repulsion. The other obvious lesson is that non-ionics are stable only at the very thin walls of Newton black films so are less likely to be good, reliable foamers as even low levels of contaminant can break through the delicate film. The Steric effect is approximated here by a simple formula that uses a constant, K, given in the literature as 35E-3, a surface charge q which in principle can be calculated from the surface potential Ψ but which is entered here directly to explore the effect independently, and a steric length, b, which represents a permanent barrier to further compression. So for h>b: Πst=Kqb/(h(h-b)). 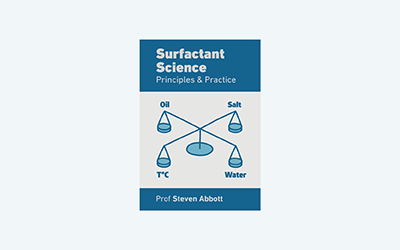 For surfactant foams the pressure Π can cover a large range, so the plot is logarithmic. This makes it hard to show the -ve Πvw, so the user has to imagine it inverted and subtract it from the positive (repulsive) forces. Moving the mouse over the plots gives the individual Π values in Pa. In some cases the -ve vdW force overrides the positive forces and the total goes negative. This can't be shown in the log plot and simply has to be imagined.